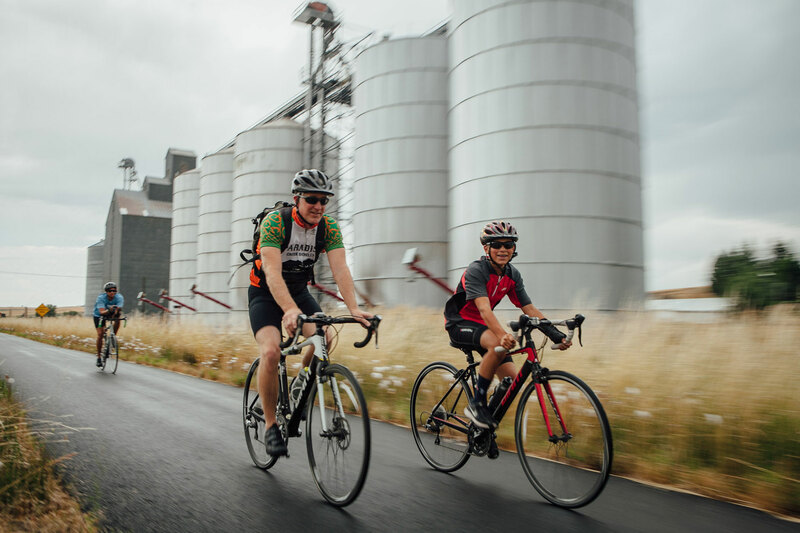 Latah/ Chipman Fondo – 50 miles – This NEW Fondo provides food, hydration, festivities, and transportation for the rider who wants a 50 mile ride experience without the risk of being on the road. Riders should be over the age of 10 or have previous riding experience. The riding times for this 50 miler are between 2 and 6 hours. The Latah / Chipman Fondo course starts at the Nazarene Church on East 7th Street and meets up with the Latah Trail via Blaine Street. From there, the course goes West for 3 miles where the Latah Trail changes into the Chipman Trail before continuing another 9 miles to Shuttle / Aid Station 1 (Terreview intersection 1 mile before the end of the Chipman Trail). Riders turn around at the trail head and ride back on the same trail for 25 miles to Troy. Shuttle stop / Aid Station 2 is in Moscow at the NRS East parking lot on Blaine street where the course started. 7 miles further down the trail is Shuttle Stop / Aid Station 3. Riders will find the next rest area 7 miles further at the Latah Trail Pancake Feed in Troy where they will turn around for the final leg of the Latah Chipman Fondo which finishes at the parking / shuttle Stop at the Nazarene Church on 7th street. The shuttle bus will follow the Potlatch Fondo route between Moscow, Troy, Potlatch, and Pullman roughly every 30 minutes. The shuttle stops are at The Nazarene Church in Moscow, NRS East Parking lot in Moscow, Troy City Park in Troy, Locomotive Park in Potlatch, and the Pullman Aid Station at the Terreview street intersection. The shuttle lap takes about 1 hour. Participants are encouraged to use the coupon they receive in their packets for a discounted ticket to attend the Rendezvous in the park Music Celebration which starts at 7:00PM (Kitty corner to the Nazarene Church in the East City Park).